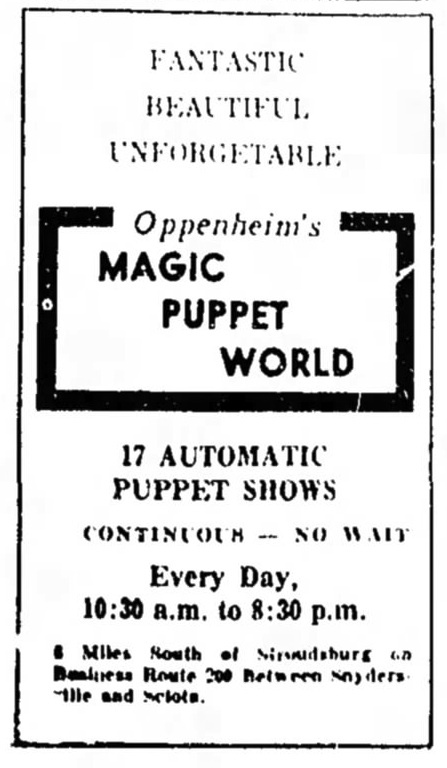 By 1975, Ralph Oppenheim’s Magic Puppet World had been going strong in the Poconos. One thing leads to another, and as with most things in his life, Ralph had veered off in a new direction—furniture making. 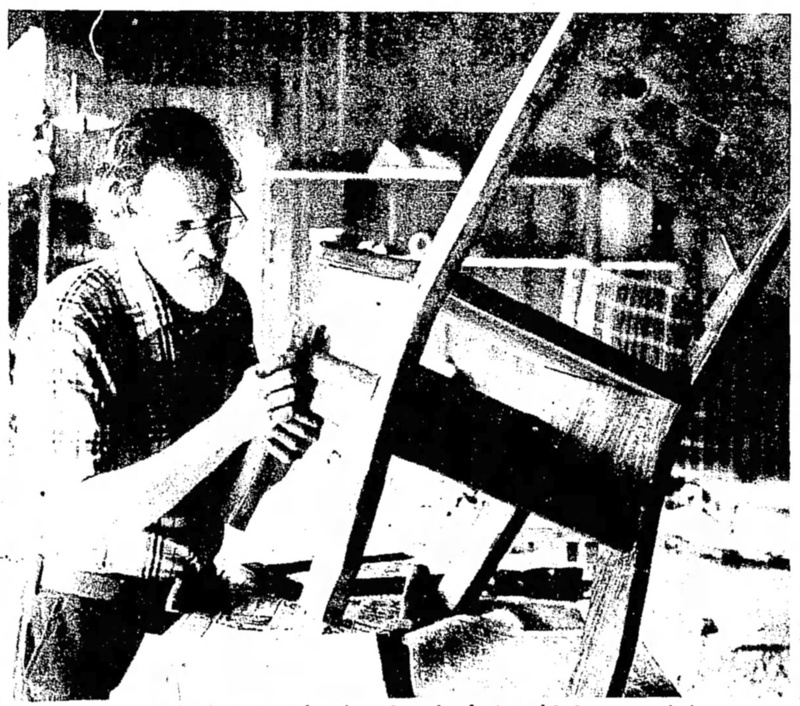 Ralph Oppenheim finishes handmade chair in his barn workshop. SCIOTA – Always at work on another project. Ralph and Shirley Oppenheim have patience. They have a reputation for creating fascinating mechanized puppet shows but they have turned their talents lo making hand-tooled furniture, including luxurious dog beds. They always seem to get involved in time-consuming projects. First it was puppet shows that take months of delicate adjustments and modifications before the figures act flawlessly. The latest is the construction by hand of a 26-piece dog bed wilh a modern art design. The project took three weeks. The Oppenheims are asking $1,000 for the bed. They have beds of several designs on sale at the Animal Gourmet, a restaurant for dogs in New York City. The furniture for humans appeals to people of more modest means. They are making tables, stools and chairs just as they were made in early America. No power tools are used to shape the wood and neither nails nor screws are used to piece it together. All of the furniture is made with pine, either clear, knotty or Southern. It is fitted together with blind pegs. Like the other work the Oppenheims do, they design the furniture together. Ralph does the carpentry and Shirley does the finishing. “You rarely see furniture that someone puts any artistry into.” Shirley said. The furniture-making started after people saw their dog beds and suggested they make furniture for people too. Oppenheim, 68, has been a skilled carpenter and tinkerer with machines for years. After World War II, Oppenheim gave up a career writing Fiction for pulp magazines to put together puppet shows, the thing that really interested him. Mrs. Oppenheim helped out and 11 years ago they opened the Magic Puppet World. The attraction, on Bus. Rte. 209 between Snydersville and Sciota, was oriented toward children until a few years ago. Then, the Oppenheims started working on a series of displays of modern sculptures in motion. To their surprise, their original art-in-molion creations appealed to children as well as adults. Hand-carved statue of modern design. Because of the changes, the place was renamed the Oppenheim Gallery and Puppet World. Oppenheim describes the new sculptures as expressionistic studies in motion. They are much more abstract and sophisticated than the earlier more conventional pieces. “We feel we haven’t completely developed it even now,” Oppenheim said. They will continue to make mechanized pieces when their attention is diverted from the furniture they are making now. “Whatever we are doing at the time seems the most important.” Oppenheim said. The early pieces are miniature shows. Lasting about a minute, the two- and three-inch high figures move and interact on a stage, their movements guided by an intricate network of fine silk threads. Five of the shows are circus acts. The rest are children’s storybook scenes. An aerobatic act and an assembly line of a sausage factory are among the shows. A half dozen figures guided by 25 or 30 strings, each with a specific purpose, comprise each show. The first one made was an animal circus act. It uses a motor-driven rotating cylinder with cams that push levers connected strings that manipulate the figures. The cylinder rotates once, taking about a minute, to create all of the movement of the figures. To design such a piece, it is necessary lo plan the motion of several figures at once and prevent all of the strings from becoming tangled. “By the time you get finished, you have to go back and do it over again, usually,” Oppenheim said. He slowly became experienced in selecting motors and other parts for the displays, accepting advice from parts dealers. Oppenheim began the work without any mechanical training. Computer experts vacationing in the area who stopped to see the show told Oppenheim that the cam design is similar to cam designs used in some modern computers, Oppenheim said. They assumed he had some background in engineering, which he does not have, Oppenheim said. In one of the shows, a lion tamer sticks his head in a lion’s mouth. In another, a balerina walks down stairs and her partners dance. All are coordinated to music, accomplished originally with use of a stop watch. “It took three months to get her to walk down the stairs to the tune of the music,” Oppenheim said. “The entire piece took over a year to make” working off and on, he said. 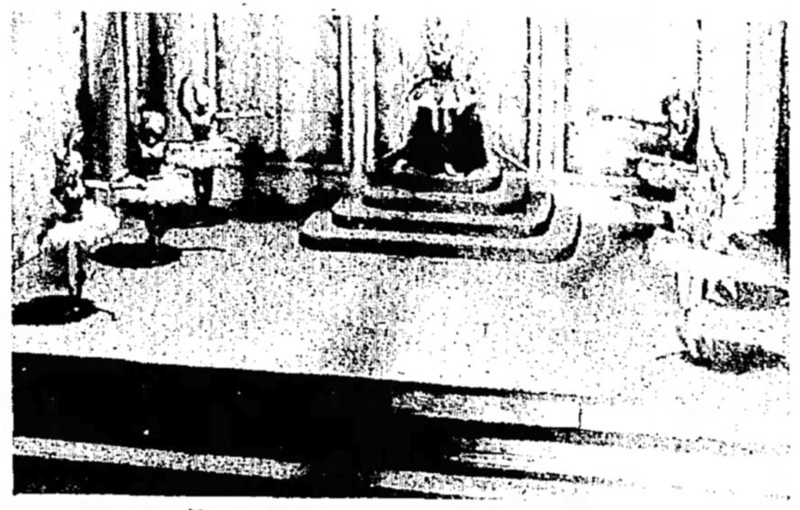 Major industries, including the Ford Motor Company, AT&T and Westinghouse, several years ago contracted with the Oppenheims to custom make puppet shows for display at trade conferences, museums and at the New York World’s Fair in 1964-65. Always, they would work together, sometimes day and night for weeks, to complete the projects on time, they said. “Both of us tear each other’s work apart and it really becomes a collaboration.” Mrs. Oppenheim said. She attended Cooper Union, a New York City art school, majoring in design. Recently, the Oppenheims discontinued making ceramic and copper jewelry. They had no time for that project along with all of the others they have going. All three of these articles from The Pocono Record cover essentially the same ground. (Today’s and tomorrow’s have pictures of the man himself included.) 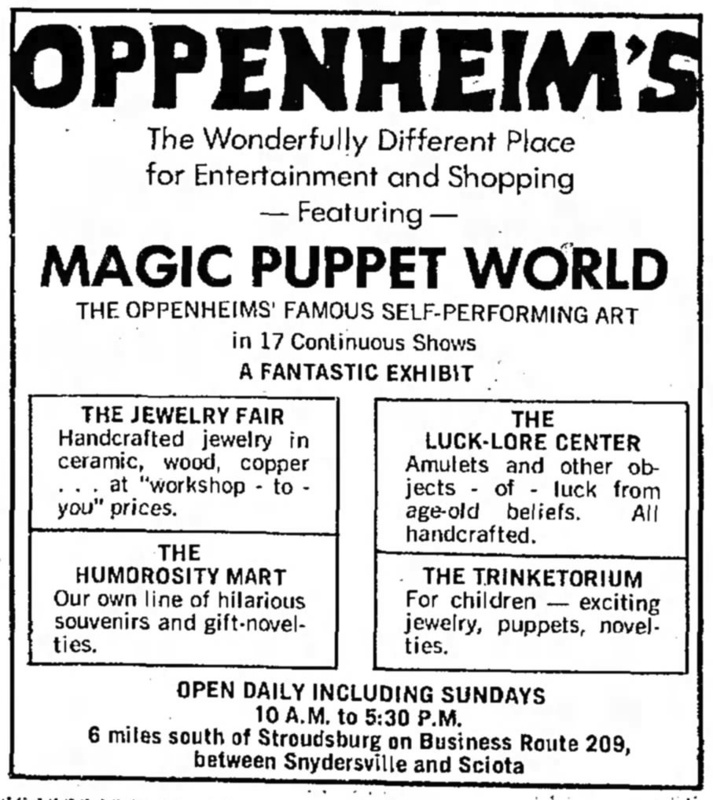 Here it’s been six years since the first article, and the Oppenheims—Ralph and his wife Shirley—have expanded upon The Magic Puppet World, now adding The Jewelry Fair with handcrafted jewelry; The Luck-Lore Center where patrons can buy amulets and other objects of luck from age-old beliefs; The Humorosity Mart which featured the Oppenheim’s own line of hilarious souvenirs and gift-novelties; and The Trinketorium—exciting jewlry, puppets and novelties for children. SNYDERSVILLE – Puppetry, which can be traced back as far as Greece in 300 B.C., has reached its culmination in the animated figures of Oppenheim’s Magic Puppet World. Ralph and Shirley Oppenheim have devoted 15 years of their lives to developing this form of entertainment and they have been running their automated show in the poconos for eight years now. Oppenheim is not sure just what to call the shows he puts on since some of the figures are moved by strings like marionettes, but the fingers pulling the strings are automated and are moved by cams on a drumb. He takes a couple of months to set up just one of these shows, Oppenheim says. First he has to think up a story for the little figures to act out. After this he must program the figures for each of their moves, each movement of the figures requiring weeks of work. The intricate moves of each of the puppets has to be gone over time and time again to get them right, he says. 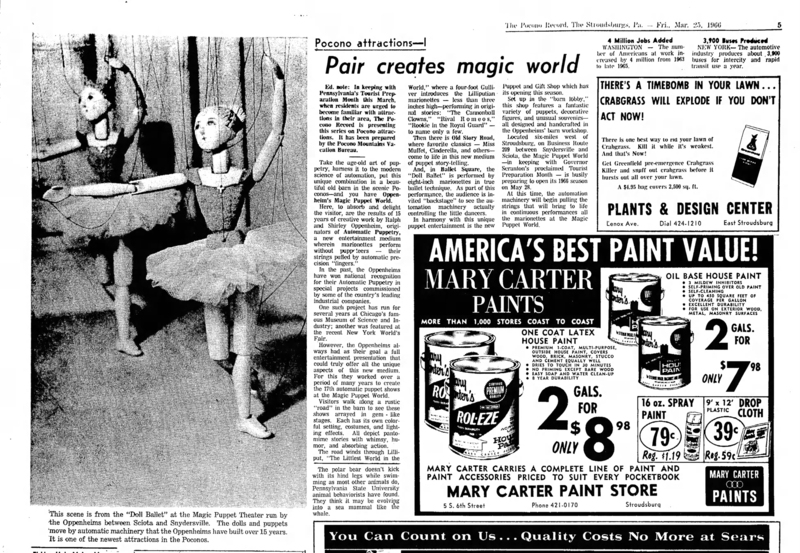 One of his creations, a ballet with seven ballerinas, took a year to create. It look him three months just to get one ballerina to move down a set of stairs. The staging is also important in these shows. Oppenheim likes the small three-inch puppets better, because they can be moved more easily and can act out a more detailed story on the small stage and are more impressionistic. 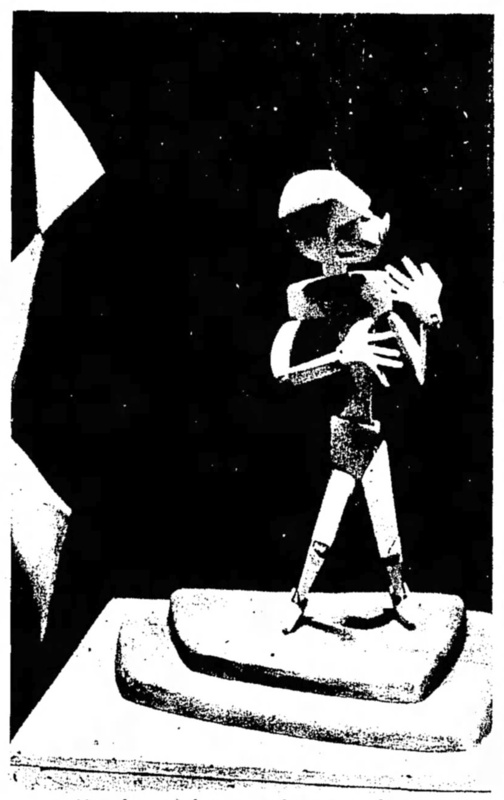 Fearsome Gulliver, four-and-a-half-foot marionette, glares down from stand along Lilliput Road at Oppenheim’s Magic Puppet World—one of many puppets moved by automated mechanisms. The larger puppels such as a four-foot Gulliver and a shoemaker and elves are controlled by wires from underneath. This allows for more fluid movement, he says. Seventeen shows make up the program at the puppet world. Lilliput road goes by the stages of the three-inch puppets, which act out shows that run for one minute each. All the stories for the shows are ones that Oppenheim has thought up or that come from fairy tales. Other are acts, such as the lion tamer act, and some acrobats. Oppenheim carves all his figures himself and has put on industrial shows for companies such as Bell Telephone and Westinghouse. His shows are not only for children, but interest adults as well. In front of the barn which holds the automated puppetry is the Jewelry Fair and the Luck Lore Center. The Jewelry Fair contains ceramics and wood earrings, pins, rings and Bobos for string ties made especially for children. The Luck Lore center is a new feature at the puppet world. Here are replicas of all sorts of amulets and good luck charms based on ancient beliefs. There are signs of the zodiac, African fetish charms, South American and Middle Eastern amulets, a tranquility amulet and a Teraphim with divining stones which is supposed to help people make important decisions. Magic Puppet World is on business Route 209 between Snydersville and Sciota. It is open from 10 a.m. to 6 p.m. daily from May 30 until Labor Day. 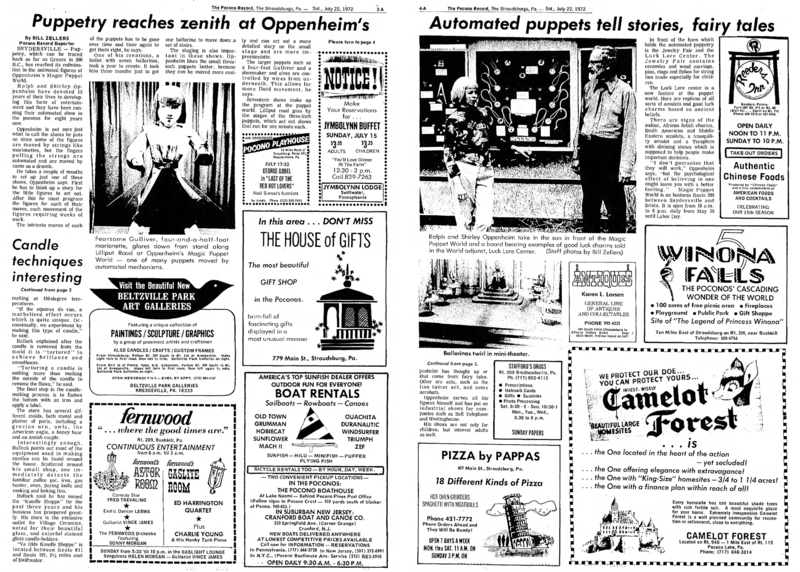 An ad for Oppenheim’s Magic Puppet World from 1972 showing the diversification that the Oppenheims had expanded to. 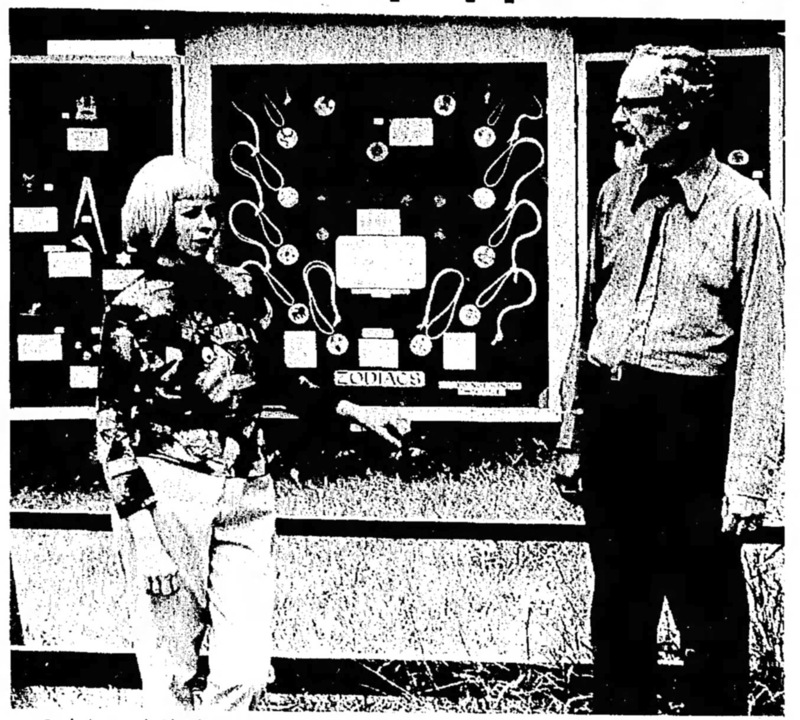 In researching the life of Ralph Oppenheim, the elusive creator of The Three Mosquitoes, the first bit of information I found on my road to finding the man was an article in The Pocono Record (Stroudsburg, PA) from 1975 (which is part three of this series of articles) which made reference to his pulp writing career. That article was the key to finding the man behind The Three Mosquitoes. There was enough information to trace him back ultimately to his birth on March 29th, 1907! While we’re working on a more detailed biography of Mr Oppenheim, here’s a bit of a preview. We have a series of three articles over the next few days that covers what he was doing after he left writing behind with the demise of the pulps during the last couple decades of his life—running a Magical Puppet World featuring 17 different annimated vingettes. Using a process Ralph Oppenheim had developed and patented! 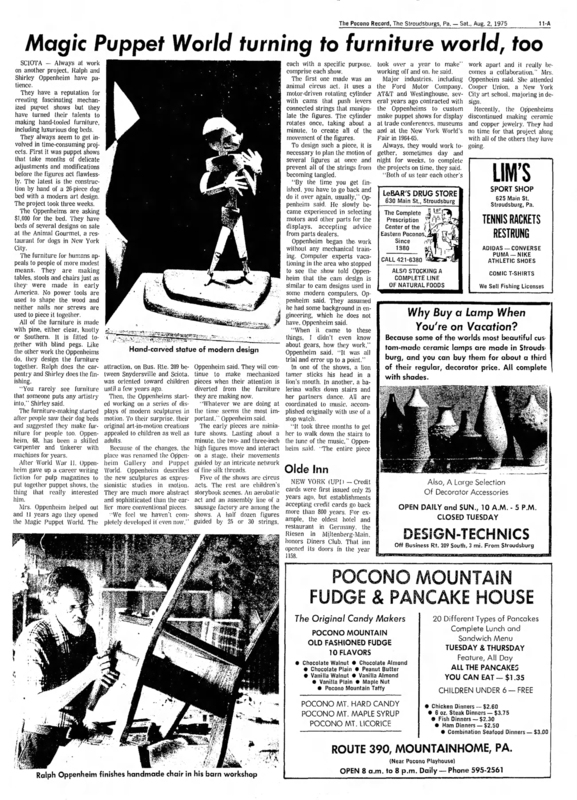 In 1965 he moved with his wife Shirley to the Poconos in Pennsylvania, where he set up his varrious puppet shows in an old stone barn and christened it Oppenheim’s Magic Puppet World! Editor’s note: In keeping with Pennsylvania’s Tourist Preparation Month this March, when residents are urged to become familiar with attractions In their area, The Pocono Record is presenting this series on Pocono attractions. It has been prepared by the Pocono Mountains Vacation Bureau. Take the age-old art of puppetry, harness it to the modern science of automation, put this unique combination in a beautiful old barn in the scenic Poconos—and you have Oppenheim’s Magic Puppet World. In the past, the Oppenheims have won national recognition for their Automatic Puppetry in special projects commissioned by some of the country’s leading industrial companies. One such project has run for several years at Chicago’s famous Museum of Science and Industry; another was featured at the recent New York World’s Fair. However, the Oppenheims always had as their goal a full entertainment presentation that could truly offer all the unique aspects of this new medium. For this they worked over a period of many years to create the 17 automatic puppet shows at the Magic Puppet World. Visitors walk along a rustic “road” in the barn to see these shows arrayed in gem-like stages. Each has its own colorful setting, costumes, and lighting effects. All depict pantomime stories with whimsy, humor, and absorbing action. The road winds through Lilliput, “The Littlest World in the World,” where a four-foot Gulliver introduces the Lilliputian marionettes—less than three inches high—performing in original stories: “The Cannonball Clowns,” “Rival Romeos,” “Rookie in the Royal Guard”—to name only a few. Then there is Old Story Road, where favorite classics—Miss Muffet, Cinderella, and others come to life in this new medium of puppet story-telling. 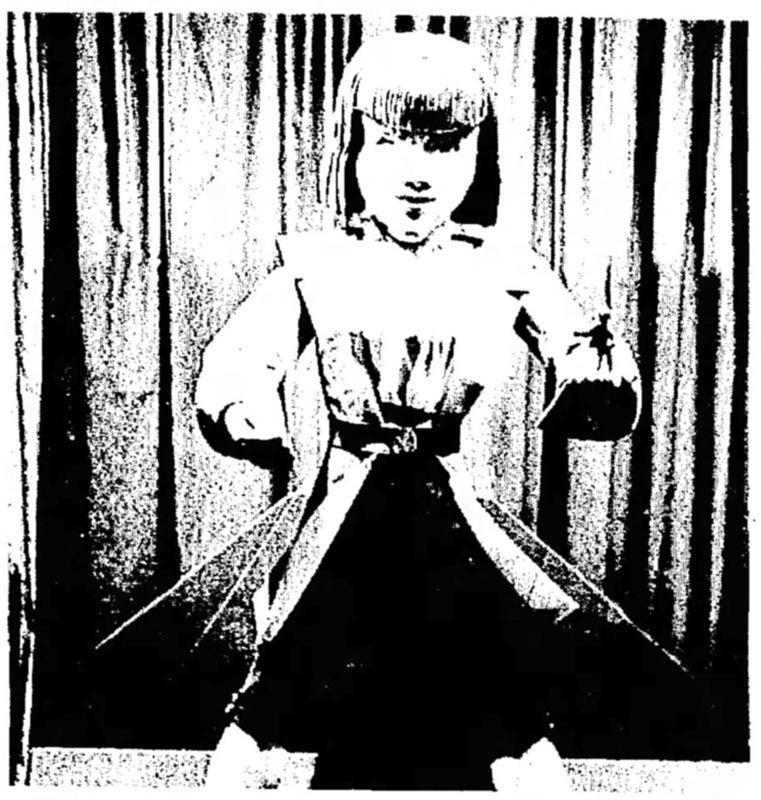 This scene is from the “Doll Ballet” at the Magic Puppet Theater run by the Oppenheims between Sciota and Snydersville. The dolls and puppets move by automatic machinery that the Oppenheims have built over 15 years. It is one of the newest attractions in the Poconos. 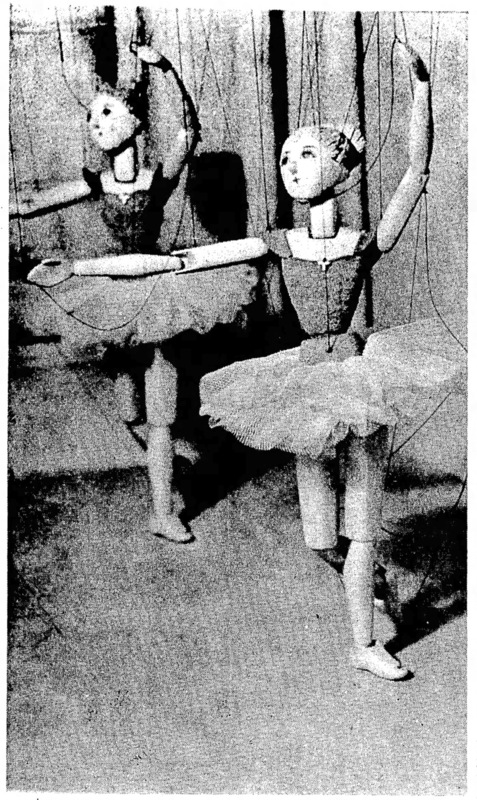 And, in Ballet Square, the “Doll Ballet” is performed by eight-inch marionettes in true ballet technique. As part of this performance, the audience is invited “backstage” to see the automation machinery actually controlling the little dancers. In harmony with this unique puppet entertainment is the new Puppet and Gift Shop which has its opening this season. Set up in the “barn lobby.” this shop features a fantastic variety of puppets, decorative figures, and unusual souvenirs-all designed and handcrafted in the Oppenheims’ burn workshop. Located six-miles west of Stroudsburg, on Business Route 209 between Snydersville and Sciota, the Magic Puppet World—in keeping with Governor Seranton’s proclaimed Tourist Preparation Month—is busily preparing to open its 1966 season on May 28. At this time, the automation machinery will begin pulling the strings that will bring to life in continuous performances all the marionettes at the Magic Puppet World. Editor’s Note: This month’s cover is the tenth of the actual war-combat pictures which Mr. Blakeslee, well-known artist and authority on aircraft, is painting exclusively for BATTLE ACES. 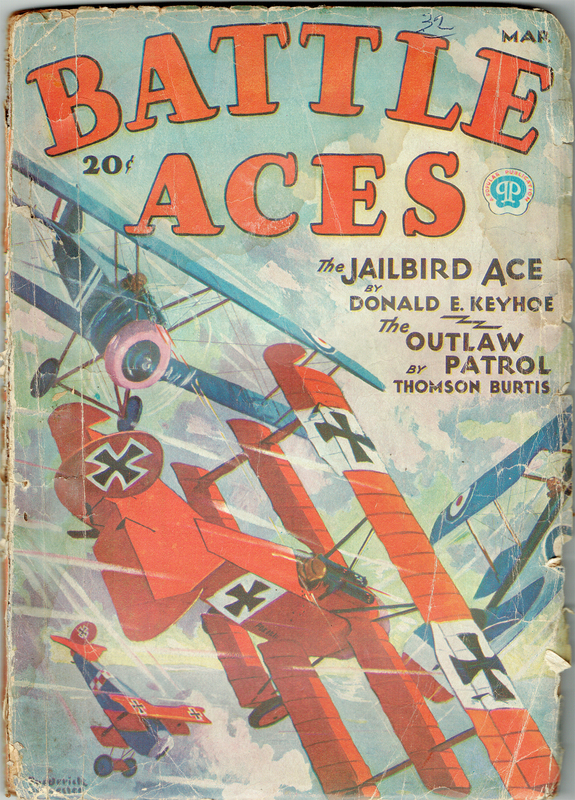 The series was started In give our readers authentic pictures of war planes in color. It also enables you to follow famous airmen on many of their amazing adventures and feel the same thrills of battle they felt. Be sure to save these covers if you want your collection of this fine series to be complete. 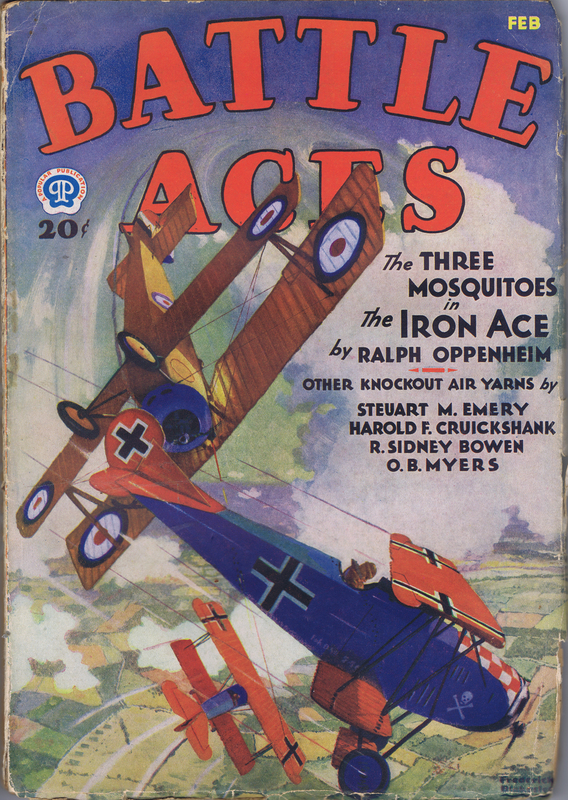 THE COVER painting this month depicts the essential elements that combined to cause the death of Baron von Richthofen. All of the planes involved are shown. deadly aim accounted for the crashing of eighty Allied planes. An analysis of his combats show that of his eighty victories, forty-six of the vanquished were two seaters and thirty-four were single-seater scouts. He killed eighty-eight men in these combats, seventeen of whom were unidentified. 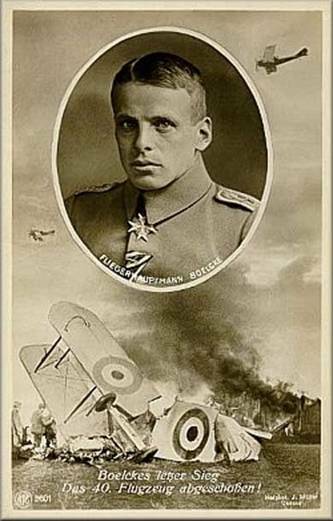 His record of eighty may be disputed, however, for there are no British casualty records to account for three of the ships which were reported by von Richthofen. If we give him the benefit of the doubt—and there is no evidence that he did not bring down these three—eighty is an imposing” record. He was the terror of the Front and in his all-red ship he blazed his way through the sky from September 17, 1916, until the day of his death, April 21, 1918. Von Richthofen’s circus became a byword at the Front. The ships composing this staffel resembled a sinister rainbow. They were painted in every color imaginable, no two ships being alike and every one having a different combination. Only one of his circus had a single color scheme. This ship—a Fokker triplane—painted a brilliant red except for the black maltese cross on its white background. It fell to the lot of Captain Roy Brown to put an end to “The Red Knight of Germany. This he accomplished on April 21, 1918, in the vicinity of Hamel. Four triplanes led by von Richthofen had dived on some old R.E.’s which were engaged on a photographic mission. 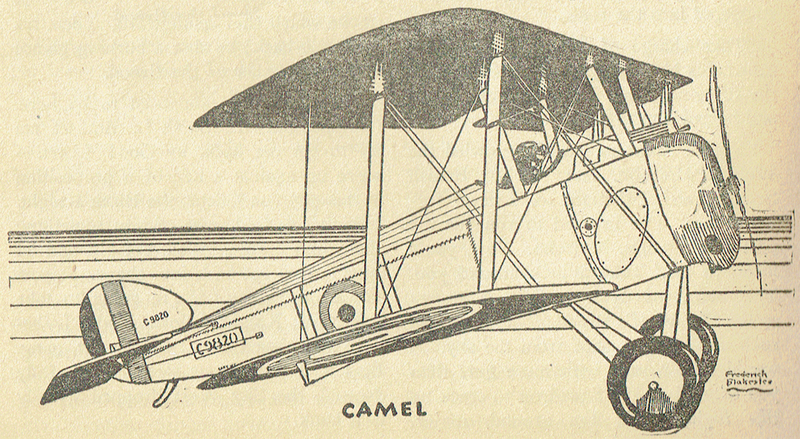 Captain Roy Brown, with his flight of seven Camels, was two miles above. His attention was directed to the plight of the R.E.’s by the English anti-aircraft calling for help. Down he came in a two-mile dive with his flight screaming in his wake. The triplanes had been joined by additional Fokkers and Albatrosses, so that they numbered about twenty-two. With guns blazing, the eight Camels plunged into the fight. It developed into one of the most desperate dogfights of the War. The R.E.’s relieved of their pursuers, streaked for home and escaped. In Captain Brown’s flight was Lieut. W.R. May, a newcomer and out for the first time. Nevertheless he joined the melee. After downing a Boche he remembered his orders to stay out of a combat, so with great difficulty he disengaged himself and started for home. Death, however, in the form of an all-red triplane, rode on his tail. Do what he could, side, slip, loop and turn, May could not shake the cool and determined fighter who pursued him. His ship was being-shot to pieces and he was painfully wounded. But fortunately death showed no partiality and also road on the tail of the red triplane. 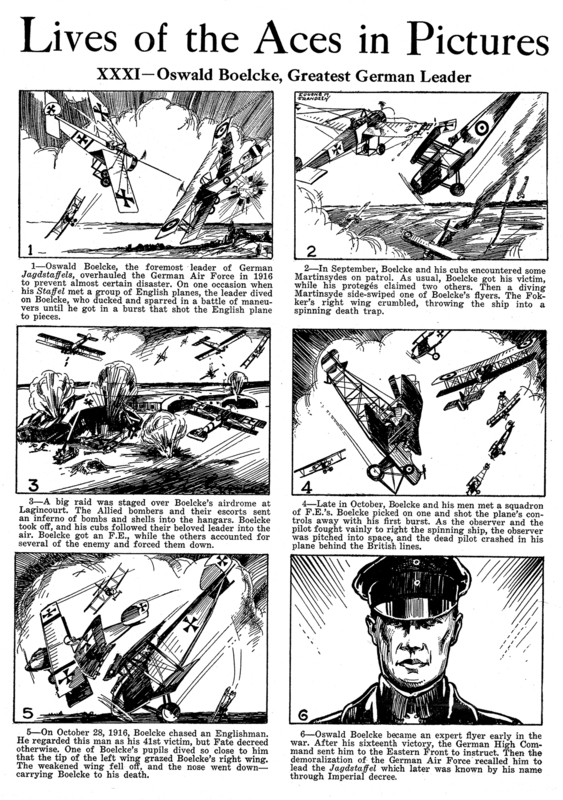 Brown had seen the unequal combat and diving in from the right his tracers tucked a seam up the body of the Fokker until they reached the cockpit. The triplane faultered, then glided to the earth, making a nearly perfect landing. It settled between the lines. The pilot did not move. An Australian crawled over the top, attached a rope to the undcr-carriage and drew it to the shelter of a rise in the ground. The pilot was taken out. Baron von Richthofen was dead. The triplane was another creation of Anthony Fokker, It was speedy and a machine to be avoided in a scrap. Some authorities contend that it had one fatal fault—its tendency to tear itself apart in the air. For this reason the Germans finally abandoned it. 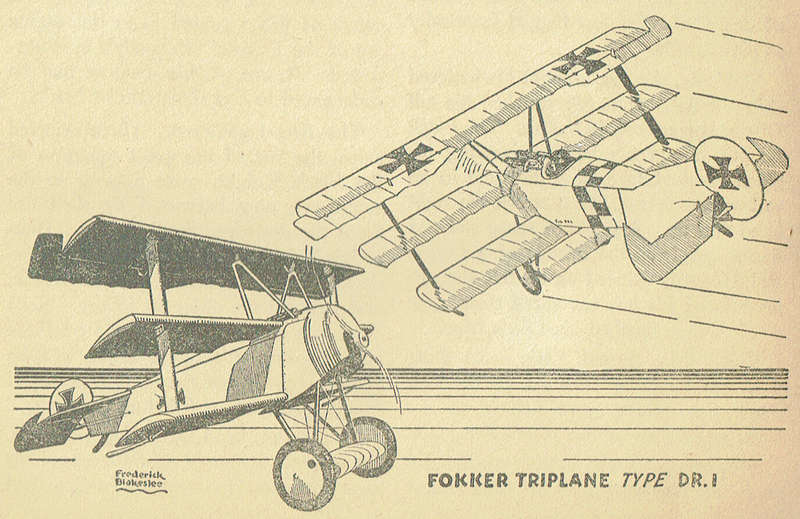 The Fokker triplane had a 110 h.p. engine and its speed was approximately 125 m.p.h. It was 19 feet, 1 inch in length over all and had a top wing span of 25 feet including the balancing fins on the aileron. The span of the center wing was 21 feet and that of the bottom wing was 19 feet. It carried two fixed machine guns on the cowl, syncronized through the propeller. Editor’s Note: This month’s cover is the ninth of the actual war-combat pictures which Mr. Blakeslee, well-known artist and authority on aircraft, is painting exclusively for BATTLE ACES. The series was started to give our readers authentic pictures of war planes in color. It also enables you to follow famous airmen on many of their amazing adventures and fell the same thrills of battle they felt. Be sure to save these covers if you want your collection of this fine series to be complete. THE HERO of the exploit featured this month is Lieutenant-colonel William Avery Bishop, the ace of aces. In his many combats, numbering over two hundred, he made an official score of seventy-two enemy planes, destroyed. Seventy-five percent of these combats were undertaken alone and the majority were against great odds. In a single day, his last in France, he brought up his score from sixty-seven to seventy-two, by destroying, unaided, five enemy ships in less than two hours. Here is the story of the action which is illustrated on the cover. It will give an insight into the daring of this fighter. The combat took place on August 11, 1917. Colonel Bishop went out that day to work independently, as was his custom. Finding the air clear of patrols, he flew to an enemy airdrome only to find it deserted. He then flew on, going at least twelve miles beyond the lines into German territory, until he discovered another airdrome. Here there was great activity. Seven planes, some with their engines running, were lined up in front of the hangars, preparing to ascend. This was just what he had hoped to find. With throttle wide open, Bishop dove to within fifty feet of the ground, sending a stream of lead into the group of men and planes. He noticed one casualty as the pilots and mechanics scattered in all directions. The Boches manned the ground guns and raked the sky, while the pilots worked frantically to take off. They knew whom they were up against. There was no mistaking “Blue Nose,” which was the name of Bishop’s machine. Furthermore, who but Bishop would come so far into their territory, and have the audacity to attack an airdrome all by himself? Here, right in their midst, was the man most feared and most “wanted” by the Germans. It meant promotion and an Iron Cross for the pilot who downed him. However he was not easily downed. At last one Jerry left the ground. Bishop was on his tail like a hawk and before the Jerry could gain maneuvering altitude, Bishop gave him fifteen rounds of hot fire, crashing him to the ground. During this brief action another plane took off but Bishop was too quick for him. He swung around and in a flash was on his tail. Thirty rounds sent this Boche crashing into a tree. In the meantime two more enemy ships had taken off and had gained enough altitude for a serious scrap. These Bishop engaged at once. He attacked the first ship, his guns ripping out one of those short bursts at close range, which were his specialty. The enemy ship went spinning to earth, crashing three hundred yards from the airdrome. He then emptied a full drum into the second hostile machine, doing more moral than material damage, for this plane took to its heels. Then Captain Bishop flew back to his airdrome, pursued for over a mile by four enemy scouts, who were too discouraged to do any harm. When Bishop left the Front he had won the M.C., the D.F.C., the D.S.O. and bar, the Legion of Honor, the Croix de Guerre, and Briton’s highest award, the V.C. For the action here illustrated he was awarded the D.S.O. You will recognize the enemy machine as a Fokker D-7, “The Wolf of the Air.” In the hands of a good pilot it was a terror to the Allied forces. It was designed by Anthony Fokker who was not a German, but a subject of Holland. He is now a citizen of the United States. This remarkable ship might have been on the Allied side, if it had not been for the short-sightedness of official England; for Fokker offered his services to England and was rejected. He then went to Germany where his value was recognized and where he was immediately employed. England, realizing her mistake, offered Fokker two million pounds to leave Germany. Since Fokker was virtually a prisoner there—but that is another story. At any rate Fokker built the Germans a ship which filled the Allied pilots with wonder and consternation when it first appeared over the lines. This ship was the D-7. It could out-speed, out-dive, and out-fight any thing then at the Front. Later the Allies produced ships that possessed certain advantages over the Fokker—notably, the Spad that could turn on a dime, the Camel and the S.E.5. 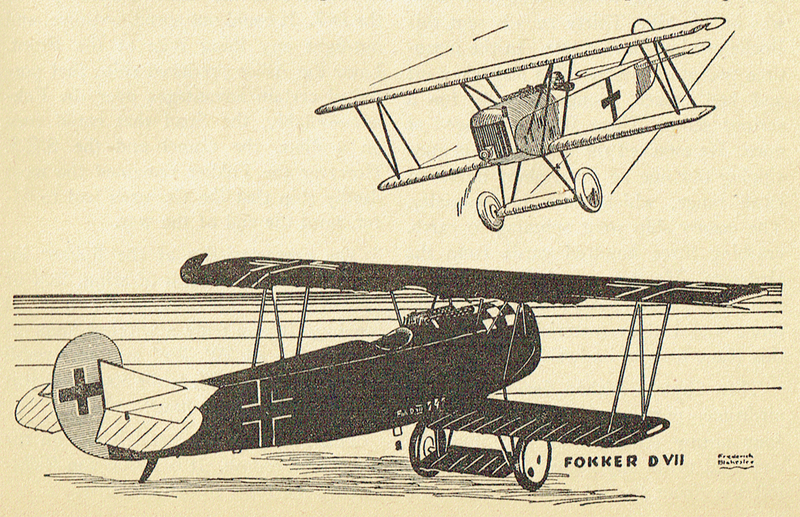 However the Fokker remained the most deadly ship that the Germans had to offer, until the end of the war. The characteristics of the Fokker include an extreme depth of wing, lack of dihedral, and the absence of external bracing. It was truly a wireless ship. It had a span of 29′ 3½” and an overall length of 22′ 11½”, while its speed was about 116 miles per hour. You will see a Fokker triplane on the cover next month. It is Baron von Richthofen’s machine, so don’t miss it! Were back with the second of three Three Mosquitoes stories we’re presenting this month. This week Kirby is tasked with flying a spy over the lines who as is usually the case, actually a german spy masquerading as a G-2 agent. When Shorty Carn and Travis realize what has happened, will they be able to reach Kirby in time? Find out in Ralph Oppenheim’s “Passengers of Death” originally published in the September 27th, 1928 issue of War Stories! Up in the air headed Kirby’s Bristol, bound on that ticklish job of reconnoitering with an Intelligence man in the rear cockpit. Straight for enemy territory they streaked. And little did Kirby know that his two companions of that invincible trio, the Three Mosquitoes, were following madly behind to warn him of— Would they make it? There was something queer about that Intelligence man. Editor’s Note: This month’s cover is the eighth of the actual war-combat, pictures which Mr Blakeslee well-known artist and authority on aircraft, is painting exclusively for BATTLE ACES. The series was started to give our readers authentic pictures of war planes in color. It also enables you to follow famous airmen on many of their amazing adventures and feel the same thrill of battle they felt. Be sure to save these covers if you want your collection of this fine series to be complete. 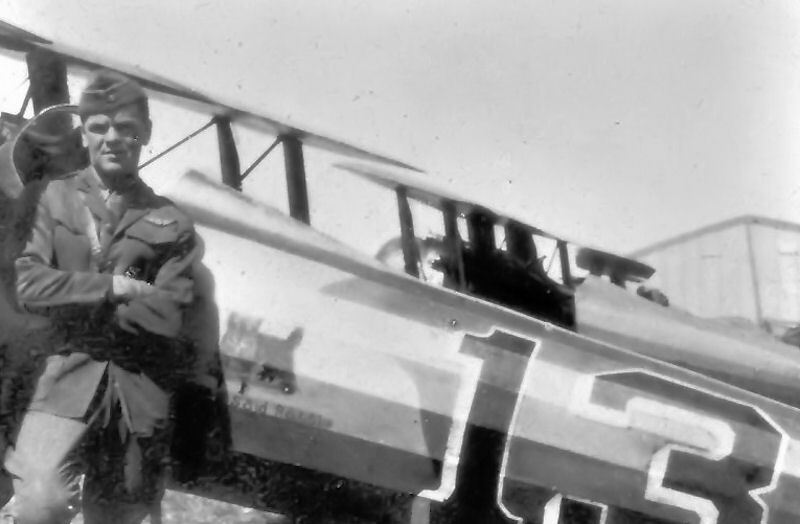 Lt. Wilbert Wallace White, 147th Aero Squadron. He was a Flight Commander for the Squadron and gained 8 victories during his service. ON SEPTEMBER 14, 1918, three reconnaissance machines took the air on a mission of observation. They had for protection Second-lieutenant Wilbert W. White. While Lt. White was cruising about above the ships he was attacked by three Halberstadt fighters. He succeeded in fighting them off and leading them away from the observation ships, which were permitted to carry on their work unmolested. On his way home he sighted an enemy balloon near Chambley. He dove through a cloud to the attack, and before the ground crew knew what had happened, the drachen had come down about their ears in flames. The Yank was instantly attacked by two Fokker Scouts. Although he was alone, with intrepid courage he attacked the first plane head-on, shooting until it went into a vertical dive out of control. Pulling sharply about, he fired a long burst at the second Fokker as it went over him. The Boche didn’t stop to argue, but streaked for the Vaterland as fast as his prop would drive him. For this thrilling exploit Lieutenant White was awarded the D.S.C. The very next month he paid the supreme price in a way that was heroic in the extreme. He sacrificed his life that a buddy might live. It was on October 10th that Lieutenant White, while in command of a patrol of four planes, met a flight of five Fokkers. In his patrol was a new member who was taking his first trip over the lines. One of the Boche pilots, perhaps sensing that he was a novice, or just by chances of combat, attacked him and obtained an advantageous position on his tail. The new pilot dodged and turned but was unable to shake off the Fokker, who followed his every move and was rapidly gaining on him. Lieutenant White saw that his friend was in dire trouble. Turning, he sped into position to attack the Boche. The Jerry was intent on his intended victim and was sending short bursts at close range whenever he could get him in line with his gun-sights. The situation looked black for the new pilot, but still blacker when Lieutenant White’s guns jammed hopelessly. 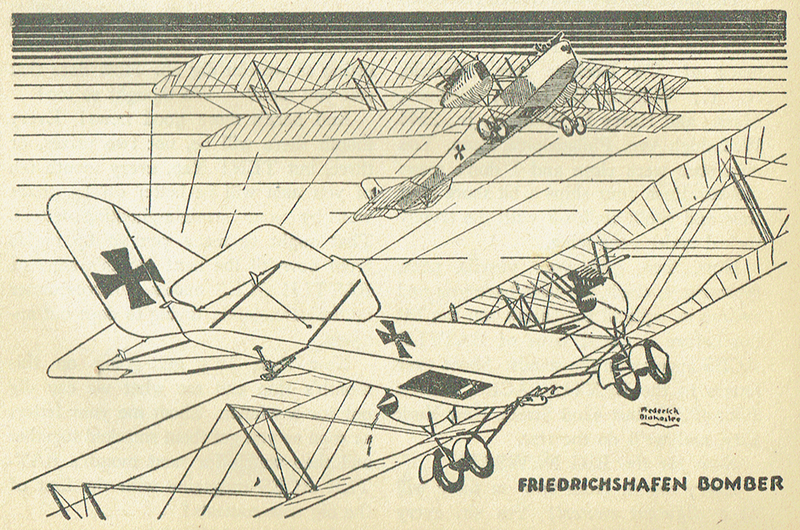 Sooner or later a burst from the Fokker would hit a vital spot. There was only one thing Lieutenant White could do to save his buddy, but it meant a horrible death. Without an instant’s hesitation he swung around and streaked full speed, head-on, into the startled and horrified enemy. The impact was terrific, the results devastating. For this act of extraordinary heroism the oak leaf cluster was awarded. The scene on the cover is just before the impact. Lieutenant White belonged to the 147th squadron which used Spads. Since there was a picture of a 147th squadron Spad on last month’s cover, I have painted Lieutenant White’s machine as a Sophwith Camel to prevent repetition in plane types. Much can be said for and against the Camel. It was an enlarged and modified “Pup” and was designed specially for high performances and extreme maneuverability. To obtain these ends some of the qualities of the Pup were necessarily sacrificed, and the machine had a reputation for being uncomfortable to fly. In fact I know of no pilot who went into a Camel squadron voluntarily. Due to the torque of the motor it was extremely difficult to make a right-hand turn. This one fault caused a great many deaths to the men in training. The Camel was also prone to catch fire in landing. The reason for this was because the engine, a 9-cylinder Gnome Monosoupape rotary, had no carbureter and therefore no throttle. It was necessary to slow down by means of a selector on the ignition system which cut out various cylinders. For example, the engine could run on 9-7-5-3 or one cylinder. The mixture in the cylinders not used was sent through the exhaust manifold unburnt and might be ignited by the exhaust from an active cylinder. The ship landed with a long flame streaming from the exhaust which very often ignited the fabric. On the other hand, it was the best ship for maneuvering ever brought out by the Allies, and was a great success in combat. The Camel could climb to 5,000 feet in 5 minutes and to 10,000 feet in 12 minutes, at which height its speed was 113 m.p.h. It had a span of 28 feet; an overall length of 18 feet, 9 inches; a maximum gap of 5 feet and a minimum gap of 4 feet, F/io inches. A distinctive feature of this machine is the great dihedral of the bottom plane, combined with a flat top plane. The ship received its name partly because of the appearance of a hump when seen from the side, and partly because the elevators were so sensitive that unless the pilot had a great deal of experience he flew in humps. Yes! 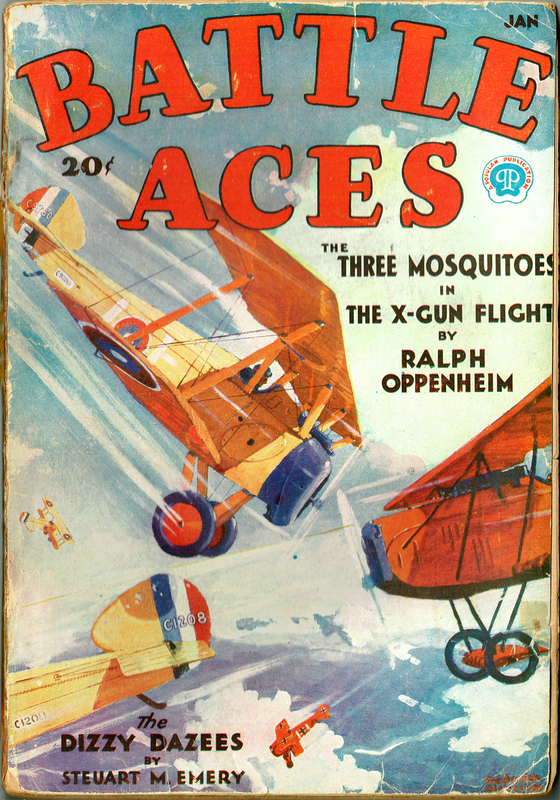 The Three Mosquitoes, and to help get through the cold winter months, at Age of Aces dot net it’s Mosquito Month! 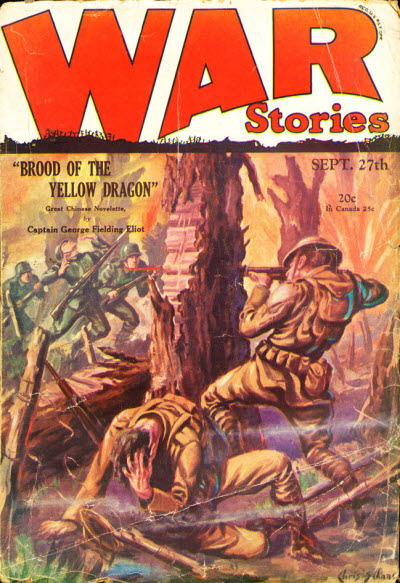 We’ll be featuring that wiley trio in three early tales from the Western Front. This week we have the classic “Two Aces ~ and a Joker” in which Kirby takes on a lone enemy plane while returning from a mission. The two crash and Kirby and the Boche flyer strike up an uneasy truce until they find out which side of the lines they are on and who is whose prisoner! 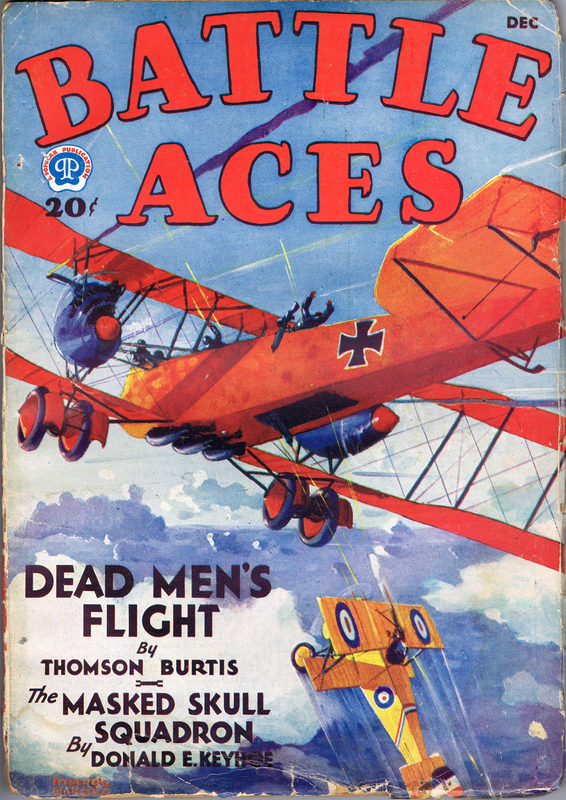 Editor’s Note: Every month the cover of BATTLE ACES depicts a scene from a real combat actually fought in the War and a real event in the life of a, great ace. 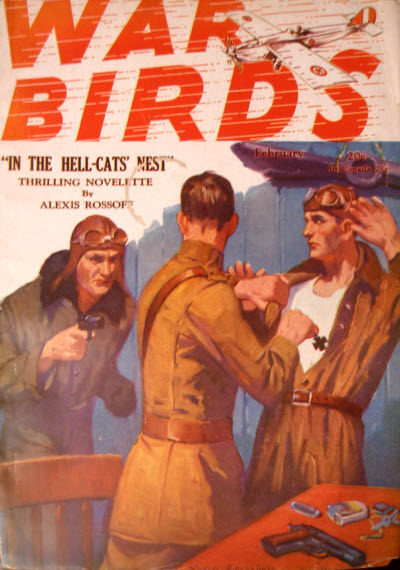 The series is being painted exclusively for this magazine by Frederick M. Blakeslee, well-known artist and authority on aircraft and was started especially for all of you readers who wrote us requesting photographs of war planes. In this way you not only get pictures of the ships—authentic to the last detail—but you see them in color. Also you can follow famous airmen on many of their most amazing adventures and feel the same thrills of battle they felt. Be sure to save these covers if you want your collection of this fine series to be complete. 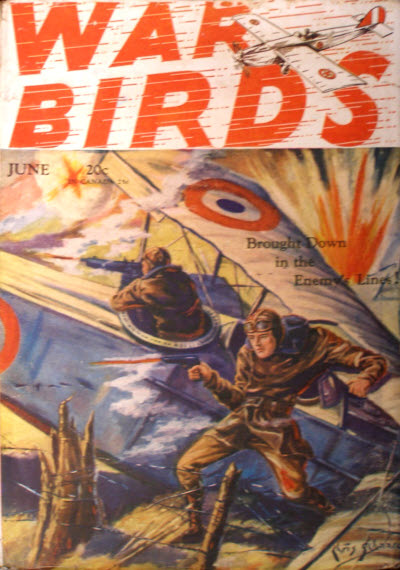 THE cover this month shows how a Friedrichshafen bomber was brought down by a Frenchman near Verdun. It was a big brute such as this that spelled the doom of Lufbury, America’s most spectacular ace. The huge ship appeared back of the American sector near Loul. Four fighting ships took the air to give it combat, but returned after expending their ammunition, reporting that it seemed impossible to damage it. The big bomber loafed along as unconcernedly as if it were an elephant with a swarm of mosquitoes at its heels. Then Lufbury obtained permission to try his hand. He took off and mounted above the dragon of the air, then swept down upon it. His machine gun is believed to have become jammed, for when nearly upon the German he swerved off. Almost at once he came back again, flashing by the Boche with his guns blazing. But still the German lumbered on unhurt. Again Lufbury returned to the attack. Suddenly the watchers below saw a line of fire burst from his machine, and the ship began to plunge earthward. We all know the manner of Lufbury’s death. He had a horror of being burned, and always said that in the event of his machine catching fire he would jump. He was true to his word, for that is exactly what he did, from a height of about two thousand feet. However, this is a digression; let us return to the Friedrichshafen. These machines were in the air what the battleship is in the sea, and about as dangerous to tackle. There was no blind spot except on the under part of the fuselage toward the bow, and it was extremely hard to maneuver for this position, due to the fact that in the bottom of the floor, just aft of the bomb racks, was a trap door from which a machine gun commanded a view downward and backward. The weak point in all big planes had been the inability of the gunners to protect the ship from an attack underneath. The secret of the invulnerability of the Friedrichshafen was that, due to this trap door, the gunner could now protect the blind spot, making the accepted mode of an attack on a bomber not only very dangerous but almost useless. The guns aboard these planes commanded a field of fire that almost completely surrounded the ship. The big red devil pictured on this month’s cover, however, was unlucky. It was returning from a bombing mission at early dawn. A French flyer on morning patrol spotted it and speeding along in the gloom that hung close to the earth, slowly mounted until directly behind the tail. Then with throttle wide open he dove, gaining tremendous speed. He zoomed up and in a flash was directly underneath, his guns blazing forth a deadly hail of lead. Then he stalled, fell away, and dived out of range. What circumstances accounted for the fact that he was allowed to approach within range, is not known. It is presumed that the crew, for some reason, had lapsed their vigil and were feeling safe either because of the early hour of the morning, or because they thought themselves over Germany. At any rate, that one burst was enough. The big crate came down back of the lines near Verdun, very slightly damaged, and was hailed with much joy by the powers that he. It would serve no purpose to give an exhaustive technical description of the Friedrichshafen. A few facts will suffice. Big ships as they were, they were considerably smaller than the Gotha, being 36 feet in length with a wing span of 66 feet. They were powered by two 225 h.p. Benz motors, one each side of the center and inclosed in ovoid bonnets. The ship weighed when loaded 6,960 lbs. Beside machine guns they each carried twelve high explosive bombs and seven incendiary bombs. The cover and the drawing below will give you a very accurate idea of how the plane looked. 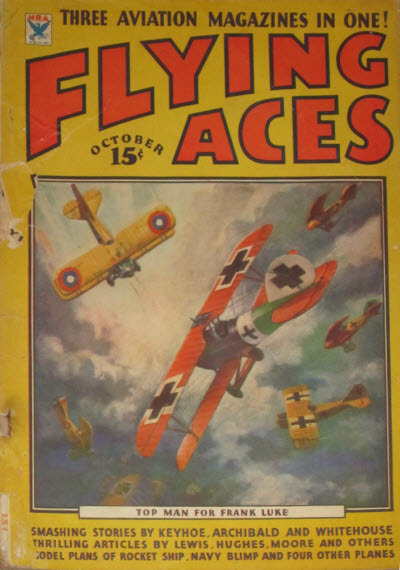 Next month’s cover will feature a CAMEL in deadly combat with a FOKKER. If you have been wanting an authentic picture in colors of a Camel machine, you will find it on the cover of the January issue. Not only that, but there is a real, gripping story behind the fight in which the ship is portrayed—the story of a valiant flyer who was willing to crash nose on into an enemy plane, willing to meet a flaming death, in order that he might save the life of his buddy. This will be the 8th in the series of actual war combat covers which Mr. Blakeslee is painting for you. 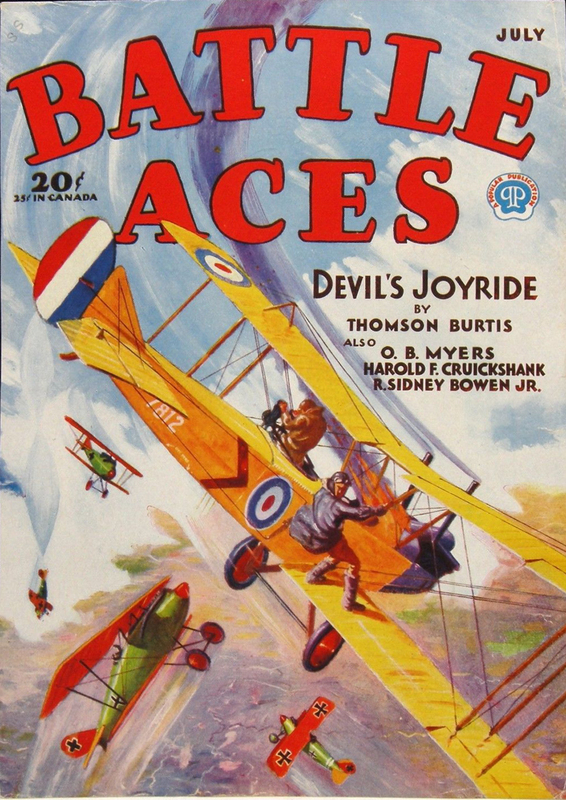 If you do not have all of these pictures and would like them so that your series will be complete, send twenty cents for each magazine to Battle Aces, 205 E. 42nd St., New York City, and specify which issue or issues you desire. 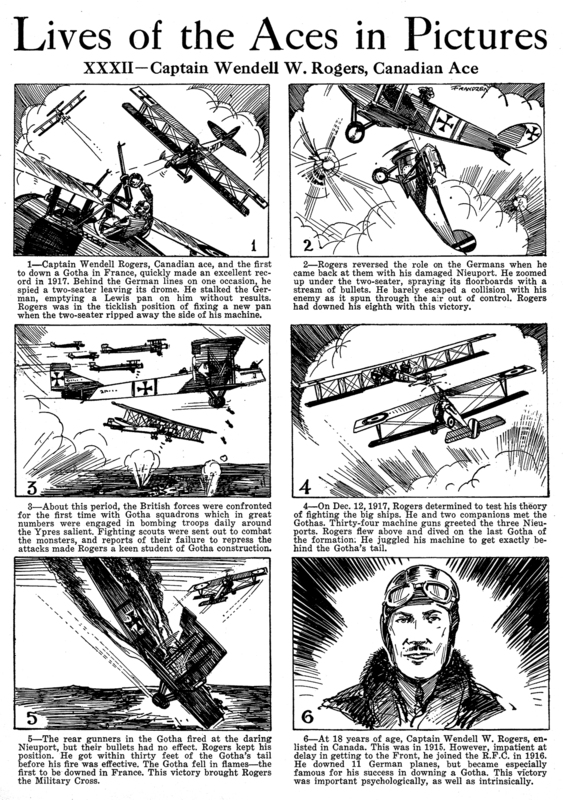 The planes illustrated so far have been: S.E.5; B.E. Fighter; R.E.8; Pfaltz Scout; Spad.